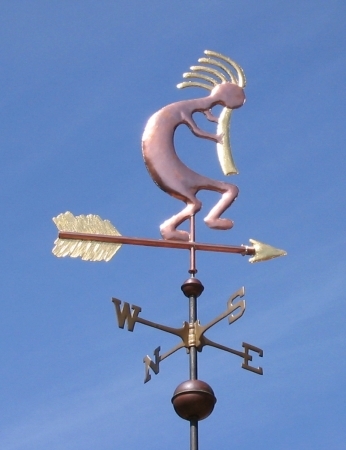 This Kokopele Weather Vane (aka Kokopelli Weather Vane) is based on an ancient mythic being associated with indigenous peoples of the Southwestern United States. Primarily known as a fertility god, Kokopele was originally depicted with a large phallus although the version depicted here focuses on his other aspect, as a trickster god associated with music. 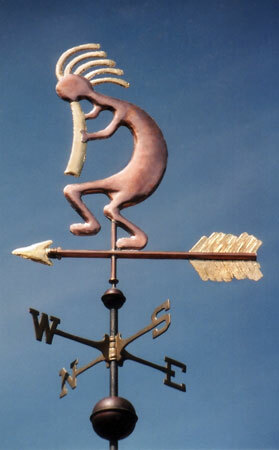 Because our weathervanes are made to order, this design can be modified to represent his more virile nature if desired. 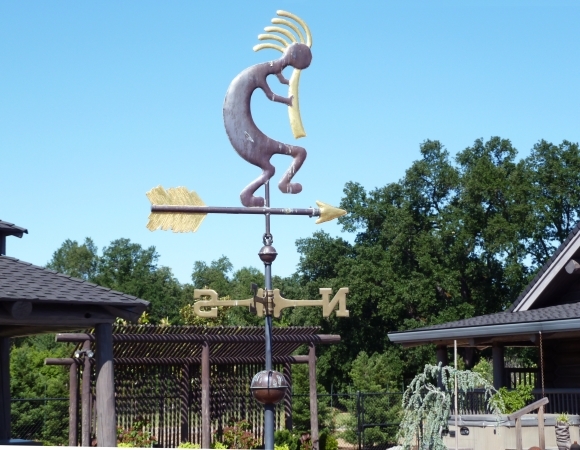 The original version of our Kokopele Weather Vane was designed to go in a garden setting, an appropriate location for fertility god. We optionally gold leafed both his hair and his horn, however, since this vane is made to order, we can make the vane in all copper as well. Kokopelli is one of the most easily recognized figures found in the petroglyphs and pictographs of the Southwest. The earliest known petroglyph of the figure dates to about 1000 AD. The Spanish missionaries in the area convinced the Hopi craftsmen to usually omit the phallus from their representations of the figure. As with most kachinas, the Hopi Kokopelli was often represented by a human dancer.